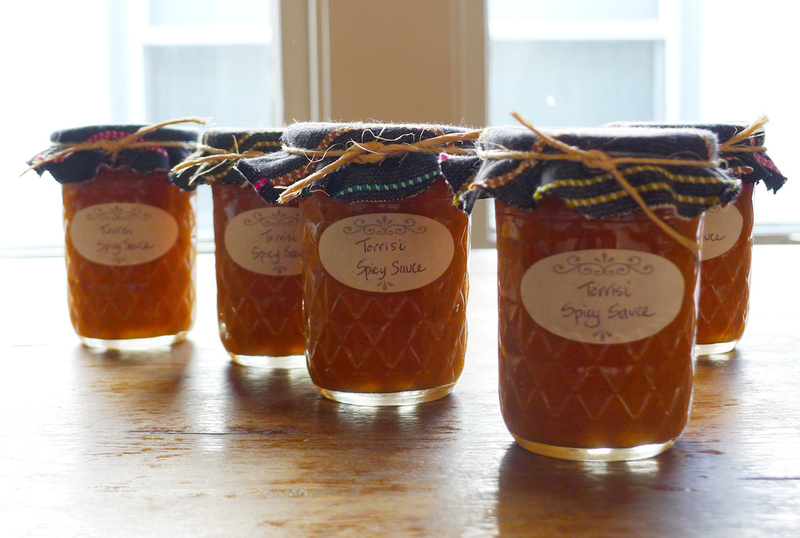 Homemade hot sauce: my gift of choice for 2013. It doesn’t work for long distance friends, as it needs to remain refrigerated. But for your locals, it’s genius. And it makes a great present in any season. I first saw the recipe on Food52.com (my go-to source for cooking ideas). Taken from New York City mainstay restaurant Torrisi, it’s spicy, of course. But also: tangy, creamy, a tiny bit tomatoey. It may well supplant sriracha in this house, which is really saying something. And with a cute little fabric hat and twine tie, it’s all decked out for gift giving, too. So I say: make 2014 the year of living beautifully, and that includes sharing beautiful things with your friends. Like this hot sauce. Enjoy! And happy new year.